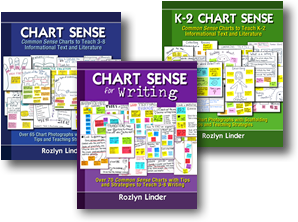 Chart Sense and Chart Sense for Writing are the ultimate resource for elementary and middle school teachers who are ready to create meaningful, standards-based charts with their students. The same charts that Rozlyn creates with students when she models and teaches in classrooms across the nation are all included here. Packed with over sixty-five photographs, Chart Sense and Chart Sense for Writing are invaluable guides for novice or veteran reading teachers who want authentic visuals to reinforce and provide guidance for reading skills. Organized in a simple, easy-to-use format, Rozlyn shares multiple charts for every reading informational text and literature standard. Don’t mistake this as just a collection of anchor chart ideas. At over 180 pages, each book is filled with actual charts, step-by-step instructions to create your own, teaching tips, and instructional strategies. Over sixty-five photographs of teacher-tested charts and examples. Easy to navigate chapters, organized by the reading and writing standards. Step-by-step instructions to create each chart. Ideas and tips for scaffolding and differentiation . . . and MORE! Not a bunch of theory or philosophy; just hands-on, teacher-tested charts that you can use in your classroom TODAY! Order copies of Chart Sense: Common Sense Charts to Teach 3-8 Informational Text and Literature, K-2 Chart Sense: Common Sense Charts to Teach K-2 Informational Text and Literature, and Chart Sense for Writing: Over 70 Common Sense Charts with Tips and Strategies to Teach 3-8 Writingsimply by following the Amazon links below. If you’d like to use a purchase order, please click here to download our purchase order cover page and enclose it with your order. 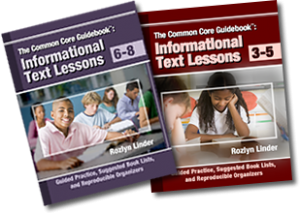 The Common Core Guidebook: Informational Text Lessons 3-5 and 6-8 are the essential resources for anyone teaching students to navigate informational text. Based on Rozlyn Linder’s popular Common Core workshops, these guides walk you through each informational text reading standard, aligns each standard to research-based strategies, and explicitly shows you how to introduce and model those strategies in your classroom. Filled with practical techniques, anchor charts, reproducible graphic organizers, and suggested text lists, these indispensable guides help teachers meet the demands of the Common Core informational text standards. A teacher-friendly explanation of each standard. Step-by-step lessons to connect the standard to students. Think-aloud modeling for each standard. Over 35 graphic organizers for assessment and practice. Order copies of The Common Core Guidebook, 6-8: Informational Text Lessons and The Common Core Guidebook, 3-5: Informational Text Lessons simply by following the Amazon links below. If you’d like to use a purchase order, please click here to download our purchase order cover page and enclose it with your order.